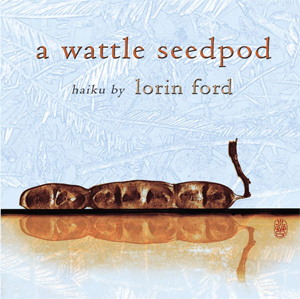 Lorin Ford’s first book will make you feel as though you were visiting Australia, as her poems are laden with the evocative names of the local places and the native flora and fauna. From Post Pressed (2008), with cover art by Ron Moss and an introduction by Dhugal Lindsay. close, open . . .
Dear Bill, what a lovely surprise! 🙂 Thank you very much for reading my little book and leaving your generous comments here. I’m humbled that you like it and took the time. You know how I appreciate your own work and your always helpful viewpoint. This wonderful collection only confirms my longheld belief that Lorin ranks among the finest of our contemporary haikuists. Many of these poems are old friends, but everything in this gathering feels new and fresh. Hi Lorin, Thank you. Along with feeling like I visited Australia, as Jim said in this post, there are many of your poems that could be from my yard and community too, in addition to the poem I included in my previous comment (trees and country roads a great comfort to me). As a general comment, I always enjoy seeing the books in THF Digital library, not only the poems, but also for more details about the book design. Seeing the cover art by Ron Moss in a larger size is an example here. The poems are easy to read. calm afternoon . . . There is a birch tree outside a window here that I’ve been watching for over 20 years – always another poem to write. I’m sure selecting and sequencing the poems for a book is an art in and of itself; wonderful the combination of new and familiar, from my perspective. Not sure where “… and an introduction by Dhugal Lindsay.” is coming from, though. There is a foreword, by John Bird, and Dhugal’s ‘picking up a jellyfish’ haiku (author’s translation) is cited. Hi Kate … I’m far from being a master, but I appreciate your generosity. 😉 This is a book length collection, though there’s nothing in it that was published later than 2007. You just need to download the pdf. I do hope you find something in there you like. Hi Ellen … Thanks very much for reading and commenting here, and I’m happy you can relate to ‘country road’. Hi Patrick … Thank you very much for your kind words. I always discover something new in Ford-san’s haiku. Delightful. Lorin Ford’s book is beautiful – on every level. Lorin is a master. Can’t wait to read a whole book of her work!! !